It's taken me a while to get around to doing some serious experimentation with my FujiFilm IS-Pro. This is basically a FujiFilm S5 with the infrared blocking filter removed and while, when released, it was ludicrously expensive the price came down to clear stock. As far as I know it was the only commercially available infrared-capable DSLR since the early Kodaks. 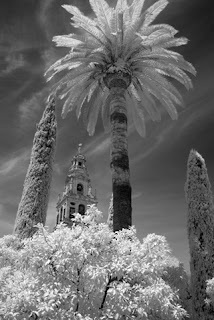 With an SLR the difficulty when photographing using infrared film was being able to see through the viewfinder. Of course you could use a tripod but this wasn't always an option. Most of the time I used a deep red (#25) filter, which gave a good Wood effect but could still be seen through, albeit dimly. The problem continues with a DSLR, especially if you don't have a live view mode. I thought I'd try filtration alternatives with the DSLR - red, yellow (minus-blue) and blue - as alternatives to opaque infrared-pass filters such as the Hoya R72. The plan was to be able to see through the lens while making the most of the sensor resolution, which means always using the green channel as it has twice the pixels of the others in the Bayer matrix. Of course the Bayer processing mixes things up quite a bit and in an ideal world I'd write my own RAW decoder ... but perhaps that's for later. ... because the blue filter does pass a significant amount of near-infrared. I think all blue filters do but I can only vouch for the Tiffen. Initial experimentation suggested that setting the camera's auto-exposure to -3 or -4 EV brought the histogram into the centre for all channels and the autofocus would work. I could also shoot at f8 and ISO 100 since there was plenty of 'light' available. The lens I used was a Nikkor 18-200 mm f/3.5-5.6 zoom which appears completely immune to the notorious hot-spot. This is the result straight out of the camera (apart from some desaturation of the blue channel). The colour palette isn't as broad as the one you get using an R72 (less greens) but I thought it quite pleasant. And what about the green channel on its own for that pure infrared look?